Home » Office » IObit Unlocker Pembuka File Dan Folder Yang Terkunci!! 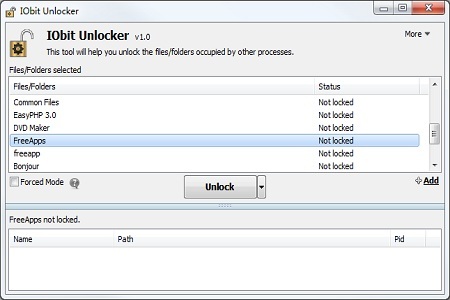 IObit Unlocker Pembuka File Dan Folder Yang Terkunci!! IObit Unlocker adalah software gratis yang sangat berguna untuk membebaskan/unlock semua file atau folder yang terkunci oleh sistem maupun aplikasi lainnya. Beberapa masalah akibat terkuncinya file atau folder oleh sistem antara lain: “Cannot delete file: Access is denied;” “Cannot delete folder: It is being used by another person or program” “There has been a sharing violation;” “The source or destination file may be in use;” “The file is in use by another program or user;” “Make sure the disk is not full or write-protected and that the file is not currently in use;” “Cannot read from the source file or disk.” Semua masalah tersebut dapat di atasi oleh IObit Unlocker.